130 a.m. and I just finished this delightful story. Kat is an ambitious and talented young lady of the ton with a rebellious streak and eye for fashion. And tortured heroes. Barrick, Marquess Withingtin fits the bill. Embattled and embittered veteran of war, he’s haunted by more than his physical losses and scars. 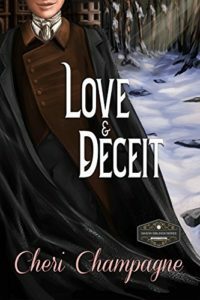 A charming story with a hint of intrigue, and dash of daring, Cheri Champagne’s Love and Deceit delivers a heart-felt adventure of loss, love, and redemption. Edited to add: I love loss, love, and redemption stories!